The Victorian season opener for the Sprintcars will be round one of the 2018-2019 Eureka Garages & Sheds Sprintcar Series at Avalon this Saturday night with one of the best fields of drivers assemble for a season opener, multiple Eureka Series Champions, Australian and World Series Champions and a host of State championship drivers are nominated. With Eureka Garages & Sheds continuing the naming rights sponsorship for a sixteen straight season this event will be a big night and a hard fought event to qualify for the Eureka Series main event that also doubles as the Fireball Derby. The Current Eureka Series Champion Rusty Hickman has recently had a few runs in Darwin to get some more laps in and he will be one to watch in this high class field that includes James McFadden and Jamie Veal that also raced in Darwin after their recent stints in America. Both Tim Hutchins and Brett Milburn are back for more of the Eureka Series where they finished the 2017-2018 Seasons Series in second and third places respectively. A few of the past Eureka Garages and Sheds Series champions that are in for this event are Darren Mollenoyux, Mike Van Bremen and Matthew Reed who is making a return to sprintcar racing after a short break, while Matthew said recently it will take him a little time to settle back in I am sure he will be on the money on Saturday night. The format for round one of the Series will be random drawn heats with two shootouts for the top six qualifiers along with the C Main, B Main and the all important Eureka Garages & Sheds A Main event. Speaking of the B main the SRA of Victoria is pleased to welcome another sponsor to the Series, “Mr Electric” thanks to the business proprietor Ricky Hoare there will be $250 going to the winner of the B Main at each round of the Series plus an end of Series award to the value of $1000 to be draw at the SRA dinner. As stated earlier it will be a tough night of racing with the quality of the drivers already mention then we have Grant Anderson, David Murcott the 2018 Classic winner Corey McCullagh and the current Avalon Raceway Track Champion, Peter Doukas, Charles Hunter, Luke Waker who took out his maiden Feature here at Avalon Raceway in the Eureka Series along with the 2017-2018 SRA season rookie of the year Grant Stansfield who was a feature winner at the Western Speedway Hamilton round last season. Both Eddie Lumbar and his pal David Aldersley will resume their battle for supremacy over each other while looking for some good Series points on the night. The Geelong district will be well represented this weekend with Mark Carlin, Terry Rankin, Domain Ramsay and rookies, Jacob Dickson and James Aranyosi who has had great success in the F500. The young Guns, Jordyn Charge and Brayden Parr are in the field and should be in with a shot to make the main event. Dennis Jones, Bobby Daly and Andrew Hughes are great supporters of the Series and will make the trip from the Gippsland region once again. 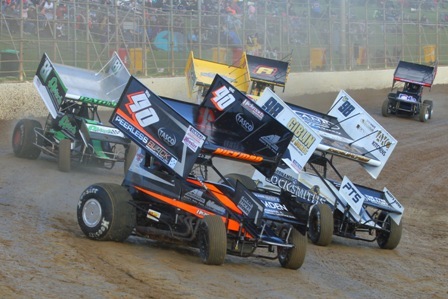 At the time of writing the Sprintcar Racing Association had received forty four nominations for this event including two lady racers, Carly Walsh and Rhiannon Burleigh. Saturday night the 13th, Eureka Garages & Sheds Sprintcar Series opening round for the 2018-2019 season at Avalon Raceway with on track action for Sprintcars to commence at approximately 5,50pm. EUREKA GARAGES & SHEDS, WESTERN NISSAN, MD MOTORSPORT, HOOSIER TIRE AUSTRALIA, CAMDEN SINGAGE & BUILDING SERVICES, PARR MOTORSPORTS, STEELPIPES AUSTALIA, LUMBAR’S TRANSPORT, AVALON RACEWAY, INDY RACE PARTS, MR ELECTRIC, D&F RACING PRODUCTS, ELIMINATOR RACE WINGS, COREY GIBSON PHOTOGRAPHY, MAXAM PRINTING, SPRINTCARWORLD.